Ok, the only reason for me to make this recipe is Kahlúa, I must say, but it turn out so great that I fall in love with the bread pudding too. Last week, I made the Challah and after eating a bit, I thought about the bread pudding because the problem of the egg rich bread is the dryness when it kept too long. So, the bread pudding is the brilliant way to use the left over bread. 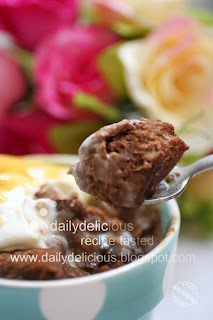 But the simple bread pudding, won't catch my attention, ^ ^, as I say that I love the chocolate and really, really love the Kahlúa (it's the only kind of the liqueur that I love to drink), so I choose the one that I want to make and eat, haha. I use the 50% cocoa mass bittersweet chocolate (it's good if you serve this pudding for the children or the people who don't like their chocolate too bitter). But you can go on with more percentage of chocolate if you like, because it will be delicious, and it will compensate the sweetness from the sauce too. 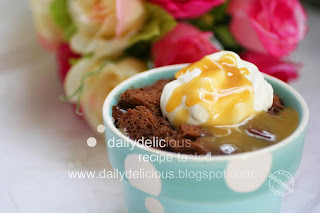 When serving the pudding, I think the whipped cream is not the option, it adds the richness and reduce the sweetness form the pudding and the sauce. 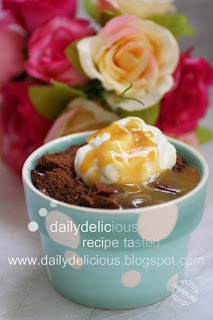 I serve this for my sister with a lot of whipped cream (much more than the one in the picture) and a small jug of the sauce that she kept pouring it over the pudding, haha. You can bake this pudding in one 2½-quart shallow baking dish, then cut and serve. Because the individual size that I make is a bit too big for some people (but not for me, ^ ^). For the great breakfast you can prepare the pudding and cover with the plastic warp put it in the fridge and bake it in the morning (it takes only 30-40 minutes to bake, a little bit more baking time because the pudding is cold), and make the sauce while baking the pudding (or make it before and warm it when you ready to serve the pudding). 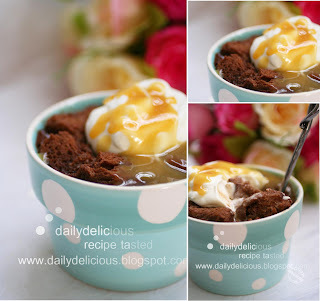 And with this delicious pudding as a breakfast, your morning will be very goooooooooooooood. 1. Prepare the bread pudding: Preheat the oven to 325 degrees F. Butter the sides and bottom of 4 (3¾ X 2½ inch) small baking dishes. 3. In a small bowl, whisk together the eggs and vanilla extract. Stir the egg mixture into the bread mixture and mix well with a rubber spatula. Transfer the prepared baking dishes. Bake until a knife inserted in the center comes out with just a little chocolate residue on it, 20 to 30 minutes. The pudding should be firm and dry on top. Transfer to a cooling rack and let cool for 10 minutes. 4. Prepare the sauce: While the bread pudding is baking, in a 3-quart saucier or saucepan, melt the butter over medium heat. 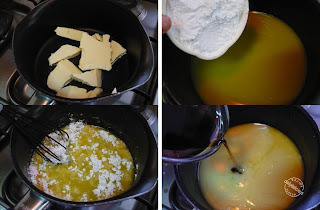 When the butter is almost completely melted, gradually whisk in the confectioners’ sugar. Add the Kahlúa and stir well. 5. 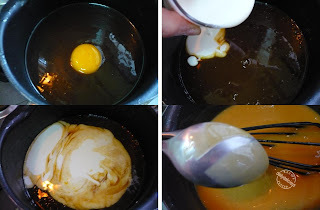 Remove the pan from the heat and add the egg yolks one at a time, whisking constantly. Add the cream and stir to combine. Return the pan to medium heat and cook, stirring constantly with a slotted wooden spoon, until the sauce thickens slightly, about 5 minutes. Don’t raise the temperature, or the eggs will scramble. To test if the sauce is ready, drag your finger along the back of the spoon; the track should remain for a few moments before it fills in. 6. Place the pan of sauce on a rack and stir occasionally until it cools a bit, from hot to warm. It will thicken as it cools. To hasten thickening, place the pan in a bowl filled with ice water to reach about two-thirds up the sides of the pan. Stir constantly until the desired temperature and consistency are reached. 7. To serve, place the whipped cream over the pudding and pour the sauce over. 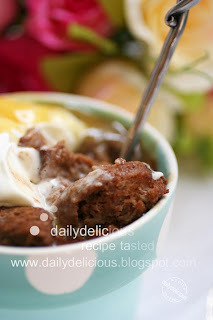 Or if you bake the pudding in one large dish, ladle a little sauce onto each plate and top with a piece of bread pudding. Ladle more sauce on top, and garnish with a dollop of whipped cream. Transfer any’ remaining sauce to a jug and serve on the side.